The emerald ash borer (EAB), Agrilus planipennis, is one of the most serious invasive species threatening our ash resources and forests. 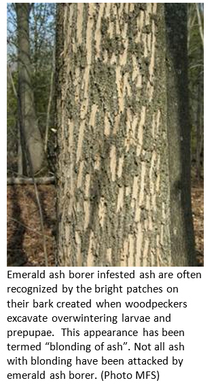 All species of ash that grow in Maine are susceptible to injury and death by the emerald ash borer. EAB was first found in Michigan in 2002. There are currently known EAB infestations in 31 states and three Canadian provinces. The closest infestations to Maine are in New Hampshire, Massachusetts and Quebec. This insect has not been discovered in Maine yet. Recently, the Canadian Food Inspection Agency announced a significant expansion of their EAB quarantine area. The expansion is particularly relevant in Maine because the boundary of the regulated area in Canada now covers most of our western border south of the Aroostook County line. The border crossing in St. Juste is less than 10 miles north of the new boundary. Although EAB has not yet been detected in the regulated jurisdictions of Québec immediately adjacent to Maine, it was found outside the formerly regulated area in several locations along the Saint Lawrence as far east as Québec City, and south to Sherbrooke, QC last season. We have contacted our Québec counterparts requesting information regarding their plans for managing the infestation, and what steps they are taking to slow the spread within the expanded regulated area. Emerald Ash Borer Quarantine Areas in the Northeast as of January 2018. 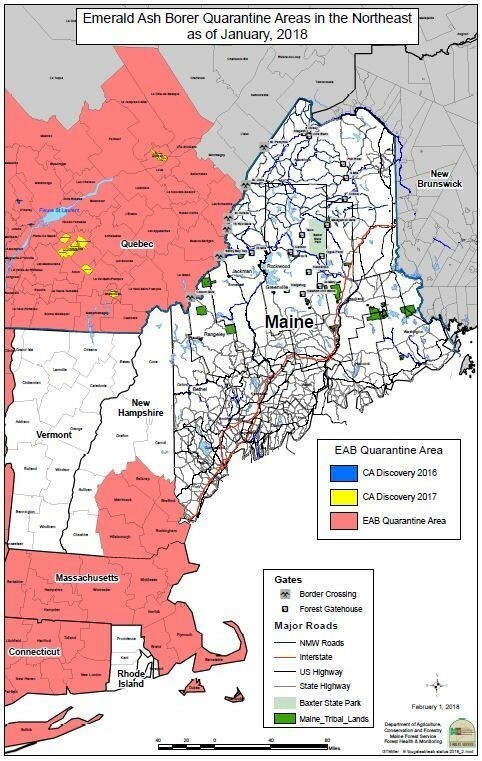 With new finds of EAB ever closer to Maine’s borders (in both New Hampshire and Québec), monitoring continues to be very important. Success in slowing the spread and managing impacts will hinge on early detection and response. Maine Forest Service (MFS) and our partners use several methods to monitor for emerald ash borer including trapping, visual surveys, trap trees, biosurveillance, outreach and education, and following up on reports from the public. The effectiveness of these detection efforts depends heavily on cooperative support and involvement from you. Thank you to everyone who has participated in our ash trap tree network. If you girdled trap trees in the spring of 2017, please plan to get your trees to one of our log-peeling workshops. We’ll be holding one in Augusta, at the MFS Bolton Hill facility on Wednesday, Feb 21. A second workshop at Acadia National Park will take place shortly thereafter, exact date to be determined. More information, including instructions for felling and sectioning your tree, will be coming soon. If you girdled a tree but do not hear from us within a week, please contact Patti Roberts to be sure you are on our mailing list [patti.roberts@maine.gov, (207) 287-2431]. Similarly, if you did NOT girdle a tree but are interested in coming to one of the workshops, please contact Patti and we will send you the details. This spring and summer the Maine Department of Agriculture, Conservation and Forestry will work with USDA-APHIS, PPQ and other partners to augment current trapping plans informed by this recent development. Meanwhile, you can help us look for this pest. Although the highest risk for introduction of EAB is close to current infestations, all of Maine is vulnerable to introductions due to the insect’s ability to spread in infested firewood. Winter is an excellent time of year to be on the lookout for EAB-infested trees. Look for ash with "blonding" due to woodpecker activity. These trees may be host to EAB. For more information about blonding, follow the top link for "Blonding on ash" from this website: http://nhbugs.org/emerald-ash-borer. To report suspected EAB damage and for more information please visit: www.maine.gov/eab.